Born and raised in Nyanga, in eastern Zimbabwe, Lazarus Takawira now lives and works in Ruwa. 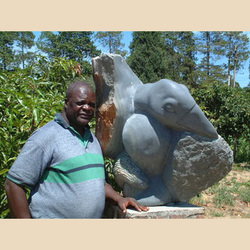 A full time sculptor for nineteen years, Takawira received much technical training from his mother and was advised and supported by his elder brothers, John and Bernard, who were both sculptors. Takawira first began to sculpt while he was a full time member of the police force. In 1980 after serving for 11 years, he resigned his commission to devote all his working hours to sculpting. Takawira is internationally recognized as a leading shona sculptor and is regarded as one of the worlds most accomplished figurative sculptors today. His approach to the stone is exceptional and his aesthetic deceptively straightforward; Every stone is a sculpture. The only thing that is needed is to remove the dirty parts. Takawira's creative process is distinctive and surprisingly rare. Acknowledging that a great sculpture depends on perfect synthesis between its finished forms and the material from which it is made, he refuses to impose an idea upon a stone. Rather than fighting with it, ignoring its inherent qualities, Takawira will wait to see what the stone says to him. Then, and only then will he begin to carve, releasing and revealing form from within. In approaching often monumental pieces of stone this way Takawira preserves a vitality that is often absent in the work of his contemporaries. This dynamism, which adds so much to Takawira's reputation, is enhanced by two factors that are more or less invisible to an uninformed eye. He works almost exclusively in Springstone, an exceptionally hard and heavy local stone that give a beautiful finish. Other sculptors are reluctant to use springstone because of its resilience , favoring softer and more easily worked stones such as serpentine. Takawira not only works with the hardest stone but he also carves, without exception, with hammers and chisels, spurning the local growth preference for power tools as the means of effortlessly, and artlessly, achieving the ends. Every sculpture by Takawira is the result of an intimate involvement with an individual piece of stone. His choice of subject matter is almost entirely figurative but Takawira's sculptures reflect much more than the contours of the human body. They are directly connected to the culture and the landscape of Zimbabwe, Mashonaland in particular. Curves and lines reflect those of a graceful, healthy figure and at the same time echo those of the landforms around him. Furthermore, it is essential to Takawira that in every corner of his sculpture there is another sculpture. By this he means that for a work to be successful each area and every plane must work independently, possessing balance and harmony at once separate yet indistinguishable from the work as a whole. A sculpture must be seen in the round to be fully understood. And of his subject matter Takawira says, "I am not a politician, I do not want to talk to you about politics, but if you want to talk to me about music, sculpture and woman, YES!" Women are at the heart of his art and his life; his wife is his muse and his mother was, throughout her life, his mentor. His understanding of woman goes far beyond their physical form to their actual substance. Not only are his stone woman a reflection of his belief that woman, universally, are emotionally and spiritually superior to men, they are also the embodiment of what is to be African. Takawira is just as concerned with the inner life of Zimbabwe as he is with external appearances. His style may be modern but the social history of his forms reflects the cultural landscape in which he lives. Selected Exhibitions 1998: Chapungu, Cape Town, South Africa Common Ground, Zimbabwe House London, UK in association with Fieldstone Private Capital Group 1997: MBCA Decade of Award of Winners, NGZ 1996: Die Skulpura 96, Germany 1994: Chapungu, Germany 1992: Rhino Watch, Cambridge UK 1991: Geo Arte Gallery, Los Angeles, USA 1990: Yorkshire Sculpture Park, UK 1989: High wick House, Auckland, New Zealand, Stone Dynamics Collective, Cannes, France 1986: Soul in stone, Sydney and Perth, Australia.